Hi, April 2019………Sorry this one has been SOLD but we have stock to build another,simply place the order and its yours within 5 weeks. A fully reconditioned 3.4 Jaguar short motor assembly, this one will fit any Mk1, Mk2, S type, Mk7 or 8, XK120 or 40 so if you have any of these there will be NO issues this one will suit you. Like all of our engines theses days this has the BRILLIANT “neoprene rear main seal conversion” done and fitted so NO LEAKS ! I guarantee it. The appropriate sump will be fitted at the time of sale. 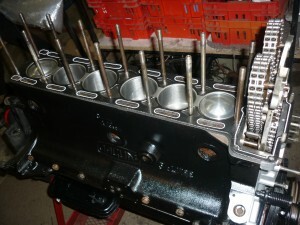 This one has been bored + .020 and quality english “County” 8:1 pistons are fitted. crank grind, bearings, chains, tensioner, oil pump and end float thrust washers are all fitted. This also has a teflon front crank seal. Freight….No problem, anywhere in the country within the week, please offer a postcode and I’ll quote it to the dollar. Price $7500.00 ………… SOLD ! GST….Yep its included in the sale ! We have a ‘FAQ document’ so email me and we’ll shoot it off to you.